All designs have been created by Linda and her staff of talented artists. We have thousands of custom designs on file. We are commonly refered to as "the best face painters in town". Many of our artists have worked with Frankenstein Creations for one or two decades. Their experience enables them to perform high quality work in a short period of time. 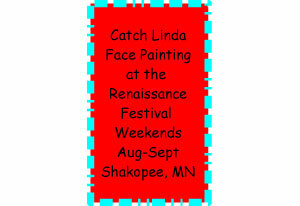 Check out this gallery of cheek art that we create for large events where time is a factor. Check out this gallery of full face designs from the Reniassance Festival and Valley Scare. Check out this gallery of body art that we paint on arms, bellies and neck areas. We only use high-quality hypoallergenic paints that easily wash off with soap and water. This water-based paint dries quickly, does not smear and will last all day (maybe longer if you don't wash your face). Our super-fine glitter is made from plastic, will not scratch your skin and looks absolutely stunning in the sun. We are always shopping for the newest supplies to add to our large collection. We can assure you that they will always be safe, fabulous and a step ahead the competition.